Ed Note: A great bit written by Scott Jolly and sent to us this holiday season. I found it, among other things, under the tree…when I took it down. This wonderful Thursday article needs to be read. Thanks Scott for writing this up. The “art and act of giving is one thing we can execute all year long. It goes well beyond the holiday period!” Thanks Scott for the guest Blog! With this quote I ask you, during this season of giving, “is there an art to giving a fly away?” Do you believe that the mysterious, superstitious, and highly competitive angler among our tribe has the capacity of giving? And if so, is it a good thing. I would argue that it is. I would also argue that there is an art to giving a fly away. The principles of giving a fly away are as simple as answering the 5 basic questions of who, what, when, where and why. The first question of artistic fly giving is, “who should give the fly away?” This is a very easy question to answer. Fisherman with insight that are having success, who can also see with great clarity, that all other anglers around them are lacking it or are yet to discover it. This concept is especially pertinent in the scenario where another angler has the courage to ask you for your insight when they see you are having success and they are struggling to solve the equation. One small act of kindness may create a moment that leads to a lifetime of discovery as it did for René Harrop. You may wonder what to give when you find yourself moved by the spirit of giving. I learned the “what to give” when a legendary angler told me “Bring a bottle of whisky over to my house at 6 P.M. and I will tell you some of my secrets”. During this magical evening, he gave me one of his self-tied flies. He gave me just one fly. At that moment, I had an epiphany. He gave me just one fly because he knew I wouldn’t fish it and lose it. Had he given me two, I could fish one and tear the other apart to discover its tying recipe. In the end, I wished he had given three flies. Giving three flies allows the recipient to fish for the moment, a second for discovery, and a third as a symbol and reminder to the act of artistic giving. The “where and when” of artistic fly giving are lumped together. The most memorable place of giving is near the action of the day. This location may be streamside, the takeout, the boat dock, the parking lot. Enjoy it while sharing a beverage. Spin a tale on how you discovered the fly, why it works, and how it found its way in to your arsenal. The memorable act if giving is then tied to the location, the fly’s history and why it will be successful in the future. The “why” of giving is most important. May I make an argument that art is “the preservation of all things considered beautiful”. I would also argue that an angler who has success recognizes all that is beautiful in the world of fly fishing. 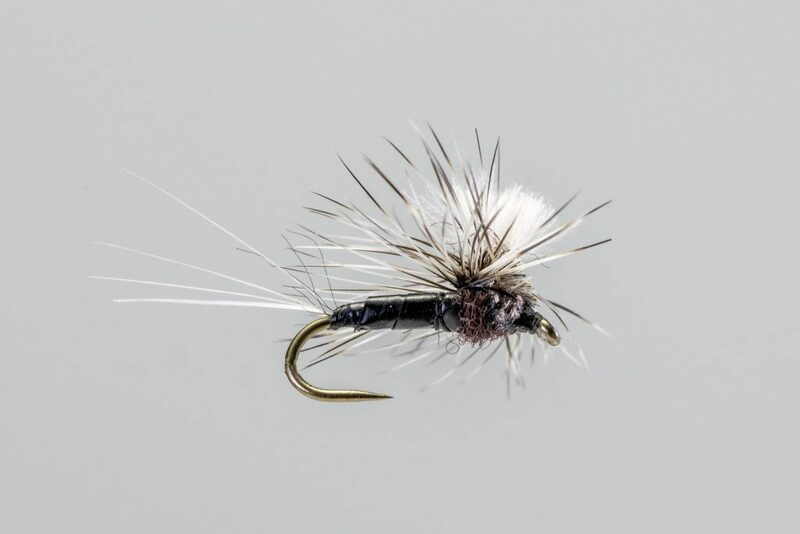 The successful angler will become an entomologist, ecologist, hydrologist and with some luck a fly-tying mixologist. They will become casters, rowers, multiple rod and reel owners. They will support our sport financially and protect it politically. The point being, is that we are all like museum curators and just like them it is our duty to preserve all that is beautiful in our sport so that future generations can paint on their own canvass in the world of fly fishing. So, there you have it … the formula for artistic gifting of flies. Now that you know the secret of giving, I hope you will take the opportunity during the coming year to change someone’s life. I ask that you give just three flies. I also ask, that you have the courage to make your moment of giving during the height of the hatch and allow others to experience how beautiful it is to fool fish after fish with exactly what they want. Become a sentry and a curator of our sport so that future generations can truly say they have mastered the art of giving a fly away.